I received customizable prints in compensation for this post. All views expressed are my own. What’s the story behind your name? When my husband and I found out that we were having a little baby boy, we decided to name him after both of our fathers. Because my husband’s father has passed, we felt it only necessary for our son to carry on my late father-in-law’s name and legacy. To celebrate the impact our fathers have had in our lives, we decided on the perfect name for our little bundle of joy: Evan Chris. Children Inspire Design also recognizes the importance of meaningful names through their new inspirational personalized designs. Through various designs, colors, and themes, you have the ability to customize artwork to display your name. Featuring a variety of pieces crafted for the young and old, everyone can take pride by displaying Children Inspire Design’s eco-friendly artwork in their home. Children Inspire Design’s personalized Banner Letter fits perfectly in my son’s room. 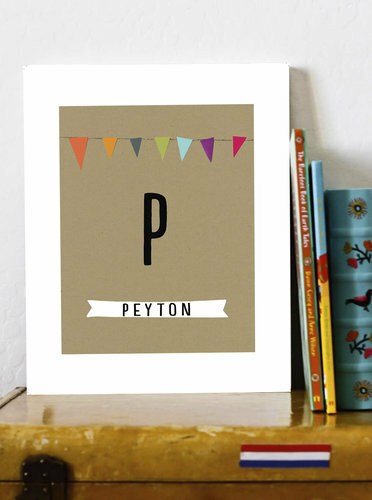 This 11 X 14 inch piece’s neutral colors and trendy design displays my son’s name in fashion. Not only do I enjoy the look of this artwork on the walls of my home, but knowing Children Inspire Design is an eco-friendly company makes me extremely happy. This customizable printable is made from high quality recycled card stock, printed using eco-friendly ink, and packaged in biodegradable boxes (how cool is that). I love the thickness of the paper and the print quality – one of my favorite art pieces in my home. The bunting printed in soft colors match my son’s room decor perfectly! Talk about unique, modern, and personal home decor! For more information concerning Children Inspire Design’s Banner Letter ($40) or other customizable artwork, visit Children Inspire Design’s website. To receive 25% off on your purchase at Children Inspire Design (this week only), use promo code CIDCHEERS13.